FILE - Afghan farmers work at a poppy field in Jalalabad province, May 5, 2012. The United States and the West have long targeted Afghan opium and heroin production. Now the industry has a new enemy: Islamic State (IS). Afghan opium farmers in areas under IS control told VOA's Afghan service that IS has started eradicating poppy crops in eastern parts of the country. IS has reportedly destroyed opium plants used for heroin production in Nangarhar's Achin and Dehbala districts and has warned farmers to find another cash crop. IS "eradicated our poppy crop because they say it is illegal," said Nawab, a local farmer who goes by his first name only. "I had a one-hectare well-grown poppy field. I did not grow wheat, and now I lost the poppy as well." Mohammad Naeem, an Achin resident, told VOA that IS militants destroyed poppy fields in the district and arrested a number of local people for growing poppy. "They say this plant is Haram [prohibited in Islam] … people had cultivated poppy in a few villages but it has been destroyed," Naeem said. The Afghan government has not confirmed the reports. However, a spokesperson for the Nangarhar governor said poppy plants have been cultivated for decades in some remote areas once controlled by the Taliban insurgent group, but now under IS rule. 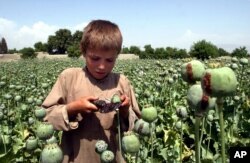 FILE - An Afghan boy collects resin from poppies in an opium poppy field in the Khogyani district of the Nangarhar province, east of Kabul, Afghanistan, May 17, 2007. Afghanistan is responsible for more that 90 percent of the world's heroin, worth an estimated $3 billion a year, according to the United Nations Office on Drugs and Crime. Analysts say the Taliban netted some 30 percent of its annual revenue from the drug trade. The Afghan government last week kicked off its poppy eradication campaign in Nangarhar. With Western aid and expertise, the Afghan government has been trying to eradicate opium crops and help farmers turn to alternative farming. Poppy fields in Surkhrud and Behsud districts are located within six miles of the provincial capital city of Jalalabad. "We do not have an accurate survey about the size of poppy cultivated this year, but poppy eradication has started in the Surkhrud district," Idress Safi, the head of the poppy eradication campaign in Nangarhar, told VOA. But Nawab said the government will not help growers in areas under IS control. "The government so far has done nothing," said Nawab, who lost this year's opium production income.